I love figuring out and making tricky quilts but sometimes I just want to not use my brain and sew! This is a super quick and easy quilt, a great scrap buster…and you can make it with very little brain power. If you’ve never made a quilt before this pattern is a great place to start. I made the crib size, but I included the info below to make 6 sizes (so much for not using my brain huh?). I’ll answer questions in the comments, so read through the whole post before you start cutting up your fabric! 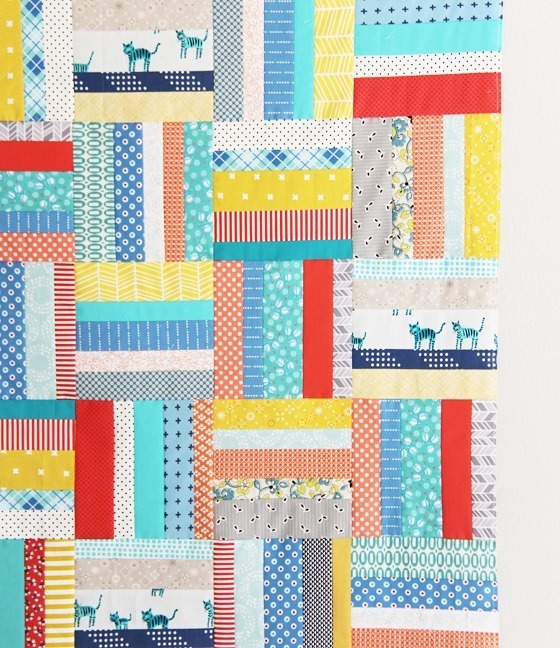 *Yardage info is at the bottom of this post if buying fabric specifically for this quilt. 2. Choose 2 of the 1 1/2” strips, 2 of the 2” strips, and 1 of the 2 1/2” strips. Lay them out how you want them sewn, it doesn’t matter which order. 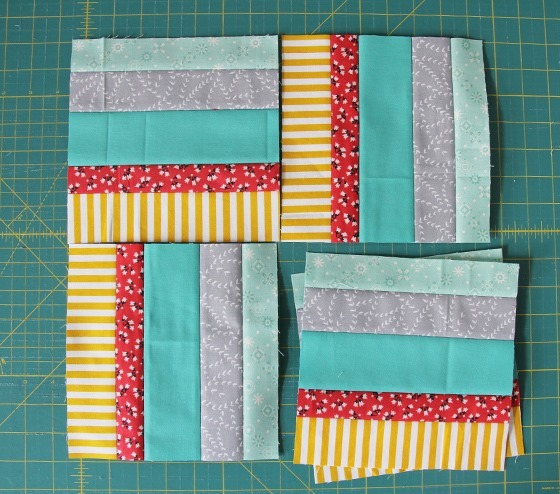 Varying the order for each strip set gives the quilt more dimension. They are laid out in order for the photo below, but I sewed them together with the sizes mixed. 3. Sew the strips right sides together to form a strip set, and press the seams of the strip set open (this is personal preference), or to either side. 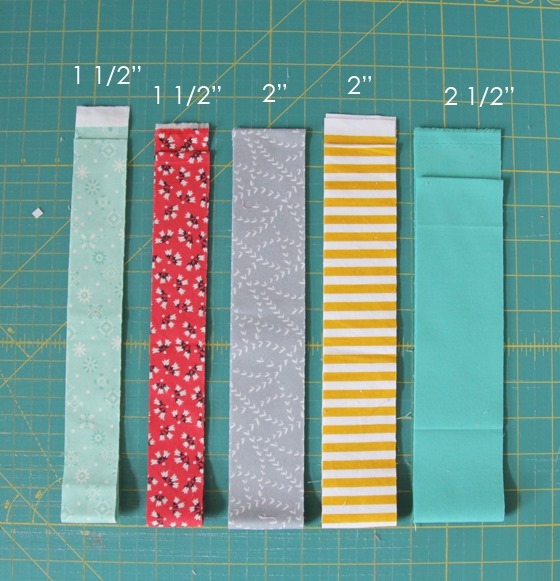 The strip set should measure 7 1/2” x the width of the fabric. 5. Lay each of the strip sets on the cutting mat, and from each strip set cut 5 blocks, 7 1/2” x 7 1/2”. When finished cutting, you should have the number of blocks in the chart above. 7. Sew the blocks into rows, and press seams towards the vertical blocks of each row. Sew the rows together to finish the quilt top! If you need help finishing your quilt you can find info here. A tutorial for machine binding can be found here. 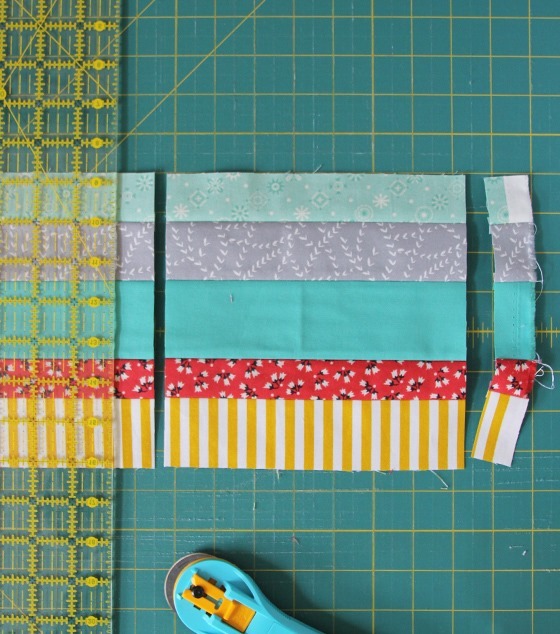 * You’ll want more than 6 fabrics for the baby size, so add in other strips here and there to add interest. These are rough estimates, you may have extra fabric leftover. From each 1/3 yard you can cut 2 – 1 1/2” strips, 2 – 2” strips, and 1 (or 2) – 2 1/2” strips, enough to make one strip set (5 blocks). Now save those scrap strips and put them to good use! I’ll answer any questions about this tutorial in the comments below. Happy quilting! So true! Sometimes mindless sewing is the best kind! Very nice tutorial. Thanks for all the great cutting info. This looks like a good way to spend a quiet afternoon in the studio with a big stack of stash! I think this quilt will be a refreshing change from your Wallflowers quilt which I am quilting now. I am doing some embroidery on the white part of the quilt. I will share it with you when I'm done. Thank you so much for this tutorial, I have always loved your generosity! You are and will always be my favorite designer of patterns and fabric! You're gorgeous for sharing how to make this, and giving so much helpful information. Your version looks cool, I love your use of colour. I've got a massive pile of low volumes that I might pull out to make this. Appreciate you doing the hard work! Also wanted to thank you for sharing the link to another blog about entertaining kids during the school holidays. Couldn't agree more. I just accept now that I'll have a few days of whinging and squabbling before mine get used to not being organised by adults and come up with some wacky games of their own invention that last for days. The whinging stops (mostly) and the squabbling cuts down a bit too! And I get a but of sewing time even though they're home. Win win. Thanks, Allison! 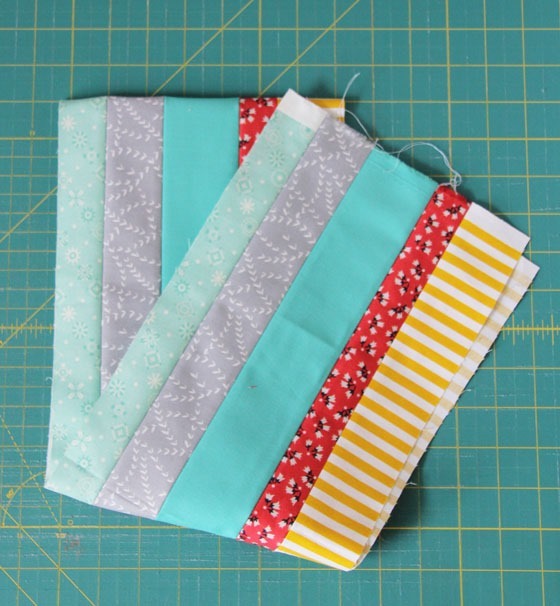 I'm focused on using my scrap strips before purchasing more fabric so this tutorial is perfectly timed. Thanks Allison! 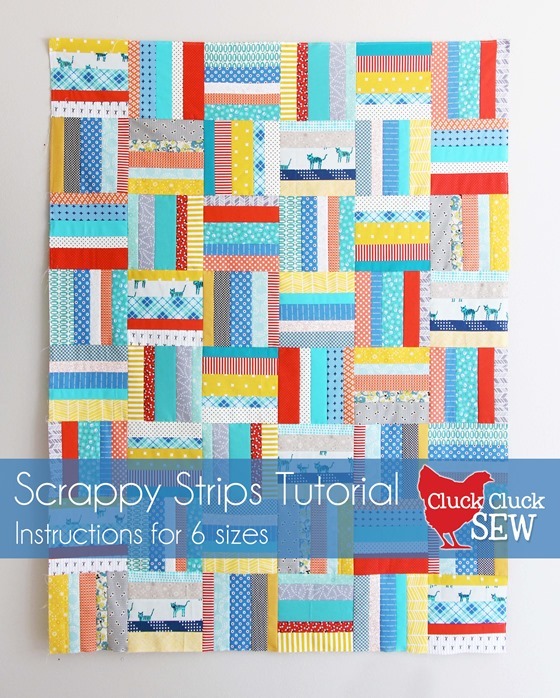 I'm focused on using my scrap strips before purchasing more fabric so this tutorial is perfectly timed. I agree, having an easy project thrown in between the more intense is welcome in my book! Thank you for sharing such a great and easy tutorial! As always, love it! Thanks for the great tutorial and for the extra math you did to help humanity. :) Cheers! What a wonderful use for scraps or for a themed quilt. I'd love to make this with holiday fabrics. Is there a way to Pin this for future use? Great quilt, thanks for the tutorial! Andrea you should be able to pin it straight from the blog…if you hover over the picture a little "pin it" button should appear in the upper left of the photo. :) Thanks! I cannot get the Pin It button to come up when I hover over the picture. Thanks for your wonder patterns. You are absolutely the best at color choice – your quilts always "pop"! This quilt is gorgeous and such fun looking. Thanks for the tutorial and I love all the different size options. I have a stack of Doe that I was thinking of cutting up into strips and mixing with solids. I wasn't sure what do next; this is the perfect pattern! Thanks! Thanks so much for taking the time to write this tutorial! I'm going to suggest this pattern for some of the charity quilts we are making in our guild! And thanks for sharing your *numbers*. Sew simple, yet so pretty! Love the fabrics you used. Have a super day! What a great tutorial and so helpful you are to give us all the different sizes. Thank you so much. I read the question about pinning the tutorial and your reply about hovering over a picture to get the little 'pin it' button. None of the pictures do that for me; instead each has a little info text giving the name of either "Summer Strings tutorial", or "Summer Strings Tutorial, Cluck Cluck Sew". I wonder if tagging the pics with the name of the tutorial supercedes the ability for the 'pin it' button to show. I'm not too blog savvy so I don't know, but I'm guessing you can't tag the picture with multiple things possibly? At least it is an idea to check out. Wow, you have made my life so much easier. I have two other friends and myself expecting a baby in less than 5 weeks and of course I left making gifts down to the wire since one lady is usually 4 weeks early with her babies. So far I've cut enough blocks for one baby quilt and it was so fast and easy. Thank you, thank you, thank you :). Hi, Allison, you've really created a great idea here – I love the simplicity of the pattern. Like you, sometimes my brain is just tired of learning something new or taking on another time-consuming project. Isn't it great to create something that you can finish in less than a month (or often more)?! The tutorial and charts are so clear, thanks for setting this up for us to use. It is nice to be reminded that quilts don't have to be complicated. A quick quilt is always a good choice for a baby. Parents are more likely to use a quilt that is not too fancy. I might even try something similar with the more random width strips a friend gave me; it would be just a little more planning and probably some trimming. 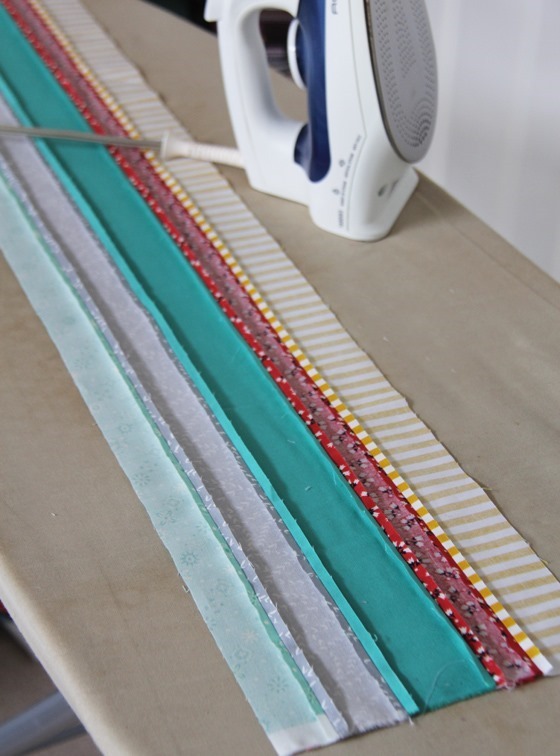 I have already used the longer strips for tube sewn blocks. Thank you for sharing. Great instructions. Very versatile. I used all rose material with black back ground beautiful! I made it u for my grandson. The only change I made is to use 2.5 inch strips (4) and then cut 8.5 inch blocks. Thank you for this cute straightforward quilt pattern. I was a patchwork nutter until struck down by a severe stroke a little over six years ago. With a fabric stash half the size of a Spotlight store I have recently convinced myself to give it a go & this is the “give it a go” pattern that I believe I can do. Fortunately I am right handed & the main disability is with my left arm. With perseverance I can control my rulers for cutting & if I go slowly I am hoping I can manage the sewing. Thank you for a design I think I can accomplish.I will send a photo when I have a result to show. Thank you, thank you! You might want to look into an Accuquilt Go or similar. I don’t even have one, but I’ve read good things about them, and it would certainly help with the arm problem. many hanks for the gread quilt tutorial. I`m a beginner and this tutorial is very easy for my. I love your blog and your ideas. Thank you for the detailed tutorial. Varied widths make the quilt more interesting. I adore it. Very cute! Is it me or can everyone read the yardage. I can’t get a landscape view to determine the yardage. If you’re reading on a phone or tablet you might have to turn it horizontally, on a computer it should look fine though. Hopefully it’s just the mobile version! I love this quilt. It’s such a simple design but the effect is so cheery and seemingly effortless. Such a happy quilt, I may make it for me! I’m a true beginner so don’t have a ton of extra fabric lying around – I’ll have to buy almost all of it! If I’m making a queen size quilt, do I really need 34 different fabrics? Or can I get away with less? I am so glad that I am now subscribing to freequiltpatterns.info/. It led me right to your wonderful tutorial. It has inspired me to tackle my sewing/craft room so that I can make a few of these lovely quilts. I was fortunate to work with a former co-worker, who makes beautiful girl dresses and she gave me loads of her scraps before moving away. I am going to put all the already long strips to great use. Thanks so ever much for a wonderful tutorial! :) I just signed up to get emails of your posts, looking forward to getting them. Won’t want to miss any. 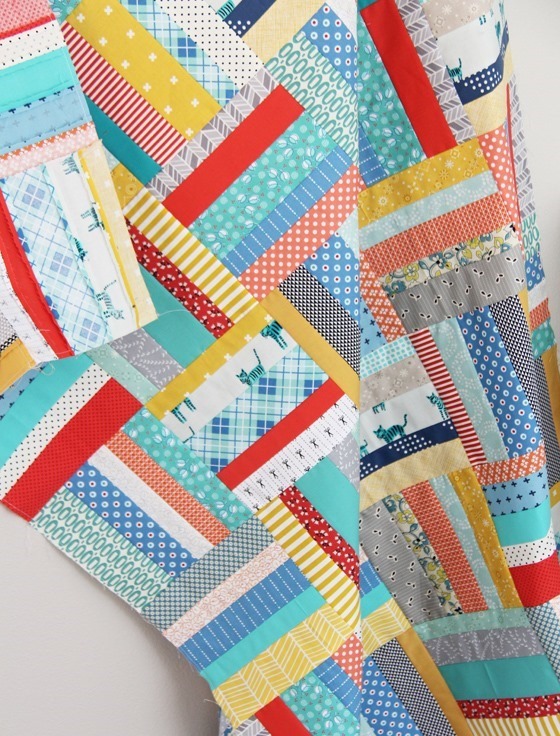 I see that I am going to have to set a timer, because I want to browse through all your past postings as well, but gotta get back to that sewing/craft room so I can get started on making these lovely quilts! 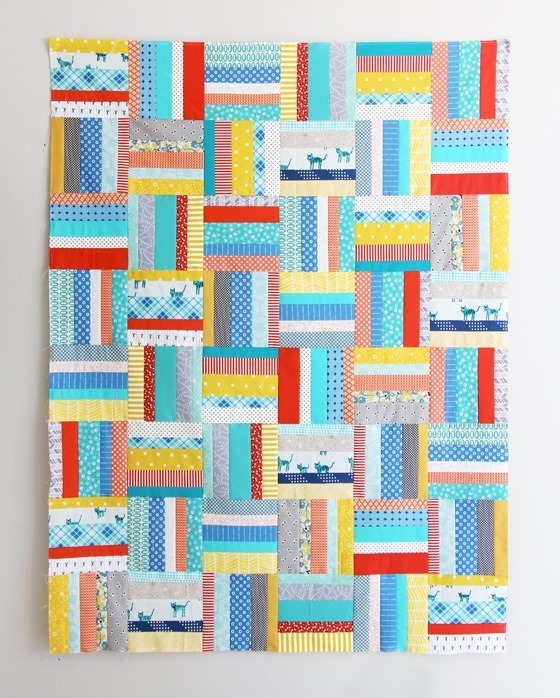 I love this quilt and the simple pattern! I am new to quilting and 72 years old – and cannot do 1/4″ seams. How do I adjust fabric needed for 1/2″ seams please? I have the perfect assortment of fabrics which came in one large bag and each different fabric is large pieces. Found at St.Vincent’s Thrift Store for $3.00! I would love to have the PDF pattern-directions please. I had cut strips for another pattern but like this better! Thanks!